Do you suffer an old Brady Bunch bathroom?Yellow, pink, blue and brown may have been in style at one point, but doesn’t match your tastes today. Some of those old pink tubs are really solid maybe the rest of the tile in the room isn’t in bad shape either. In any case, if you are not ready or looking for a full gut, Tub and tile re-glazing may be your solution for that aesthetics problem. The whole process can be completed within one to two work days, transforming your room into a cutting-edge addition to your household. We even can glaze, sinks, and shower bases! In this economy we can’t waste time or money! With glazing, you are provided the option of refinishing you current tub to have a dazzling new look as good as a new tub that might be beyond your budget or an unnecessary expense. Cracks, rusts, and stains will be filled and removed prior to the tub glazing, giving you the full service fix that you need to make your bathroom feel brand new. Our reglazing service includes a five year warranty. The product we usehas one of the best fluoropolymers in the industry. Fluoropolymers have been recognized as polymers for functional coating surfaces with unique properties, such as low friction and abrasion, oil and water repellency, non- adhesive surfaces and antifouling. These unique properties are due to the small bond polarization of the fluorine-carbon bond which is responsible for the low surface energy of this polymer. Not only is the finished product long lasting, with a beautiful finish, but its low maintenance which means it doesn’t take much to keeping it clean. They recommend a mild soap and sponge. 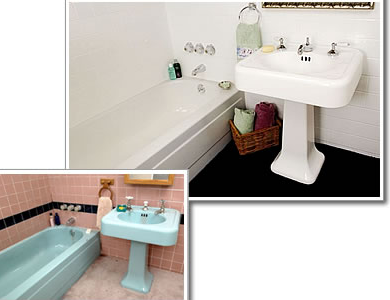 The process to turning your tub and tile into something that looks new, is pretty simple. We first start with cleaning and prepping the area that is getting sprayed by taping off the area and protecting the rest of the area with drop clothes and plastic. We use industrial cleaners to make sure the surface is completely clean of all derris and mineral deposit. Than we fix any crack, chips or rust by first sanding and then filling the area with epoxy. After that is completed we start the spraying process. Most projects are completed in just one to two days. 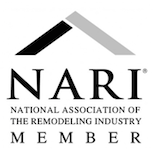 What do you get when working with Done Right Remodeling? You get a boutique construction firm that handles all aspects of bathroom renovation with precision and efficiency.